Adjuvants & Formulations is a bi-monthly digital magazine published by SURfaPLUS Internet Services. Adjuvants & Formulations focuses on all companies, institutions and individuals involved in the production, distribution sale, use and registration of adjuvants and formulations. Adjuvants & Formulations is produced by Hans de Ruiter (Editor in chief) and associate editor Gert C. van den Berg. A subscription is required to get access to the magazine. The magazine started in May 2004 as Adjuvant Newsletter and we changed the name in Adjuvants & Formulations in October 2014. Information on the development, testing, use and registration of adjuvants and formulations for agrochemicals. The magazine is useful for those who want to receive a regular update on various aspects of adjuvants and formulations for agrochemicals. Adjuvants & Formulations provides direct hyperlinks to relevant websites and persons that relate to the contents of news items. People interested in this magazine can download a free issue of Adjuvants & Formulations. Every two months, the subscriber will receive an Email message that a printable new issue in pdf-format can be downloaded from the customer's directory on this website. Email, intranet and printed copies can be considered as vehicles for internal distribution. In addition to the subscriber, other users of the same company/institution can be added. See also the subscription general information and the step-by-step subscription tutorial. A few of the already published issues are available as special interest issue. See Purchase Magazine for these issues. You can purchase online a 1-10 user license or a multi-user (>10) license. You have access after receipt of payment. For more information contact Hans de Ruiter. See also the terms and conditions under licenses. 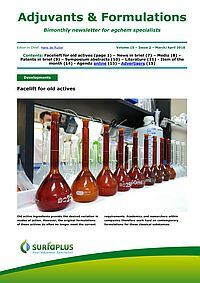 Would you like to stay informed about the latest we published in our magazine Adjuvants and Formulations? Than subscribe to our free email alert service for a preview of the latest news in each issue.